US musician Regina Spektor has been the victim of identity theft on social-site-of-the-hour Twitter. The up-and-coming singer exposed the imposter via her official MySpace blog this week. It is the latest in a number of high profile celebrity imposters on the social networking site. “I found out that there has been a mystery person posing as me on Twitter for a while. Even my record label thought it was me. And it made it into the London Times top Twitters list. Somehow, I had no idea,” said Spektor. The imposter, @ReginaSpektor, had amassed just under 30,000 followers. The account has since been deleted. Ms. Spektor is not the only celebrity to have had her identity stolen on Twitter. Angelina Jolie, David Tennant and Chris Moyles have all been impersonated on the social networking site. Twitter has become a popular way for celebrities to communicate with their fans and notable celebrity members include comic Stephen Fry, singer Lily Allen and actor Demi Moore. Wolfram Alpha, the long-awaited search engine, has launched. Despite initial theories that the website would revolutionise the search industry, reaction to the ‘mathematical search engine’ has been mixed. A proportion of commentators have hailed the site – which answers specific queries directly rather than guiding users to a third party domain - as the next stage in the evolution of search. Meanwhile, critics expressed concerns over Wolfram Alpha’s limited success in returning queries. The site’s commercial viability has also come under scrutiny. The search engine giant Yahoo! is considering a move into the social networking market, according to its chief technology officer. Speaking to the Reuters Global Technology Summit in New York, Ari Balogh confirmed that the company was lining up acquisitions and partnerships with several companies. “I can guarantee you there will be some acquisitions, and we will do some stuff in-house," he said. Balogh’s announcement comes after a turbulent year for the company. A decrease in PPC sales and aggressive competition from other search engines, such as Google, have seen the fortunes of Yahoo! decline considerably, forcing the company to cut over 1,000 jobs in 2008. While Balogh admitted that Google had “won the game” of search as it exists today, he said that Yahoo! would remain a major player in the search market. 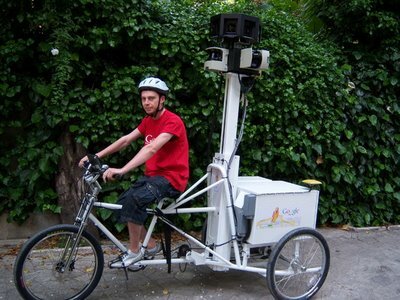 Google has enlisted an armada of tricycles for the next stage of its ongoing Street View service. The humble fleet of bikes has been acquired in order to photograph streets too small for the Google car to drive through.